This spacious 6-acre park features 900 ft of shoreline and hosts Chassell's largest annual event, the Copper Country Strawberry Festival sponsored by the Chassell Lions Club. 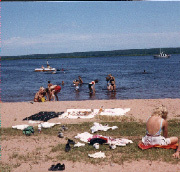 This annual event, the weekend after the 4th of July, attracts thousands of visitors each year. It features a parade, strawberry shortcake, BBQ Chicken, live entertainment, a Queen coronation, and numerous arts and crafts vendors in the Park. Home of the Chassell Little League teams and the Chassell Women's Softball Team. 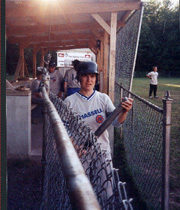 The field is owned and operated by Chassell Township. It features two dugouts, a backstop, fenced field, a utility building, scoreboard, batting cage, plus 2 sets of bleachers for fans. Each summer, up to 6 teams practice here and maintain regular game schedules and host league tournaments here. Misslitz field is accessible from Second Street off US 41. Turn into the Chassell Heritage Center parking lot and continue West past the museum. This classic cross country ski trail features 10 kilometers of beautiful daily groomed and tracked trails. The public is invited to ski over rolling hills, through sunny pastures, past picturesque ravines and under a canopy of protective forest. It also features a beautiful lighted segment of trail every evening till 10 pm. 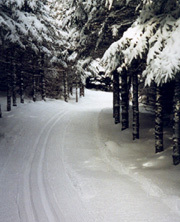 The trail is Home of the annual Copper Country Classic Ski Race. You'll find the trailhead of the Chassell Classic just West of the Chassell Heritage Center. The parking lot for the Trail and Center is accessible from Second Street off US 41. Donations are accepted at trail head to offset volunteer grooming costs. Chassell Township owns and operates Two Ice Rinks! We have an outdoor ice rink just East of the Chassell Heritage Center accessible from Second Street off US 41. The other outdoor Community Ice Rink is located in the Chassell Centennial Park, located on Pike Bay. You'll find it in the center of Chassell by turning East onto Third Street off US 41. Posted hours accommodate both free skating and hockey. The rinks are lit for night skating and a warming shed is always open for skaters and visitors. Community volunteers chaperone and help with maintenance and improvements.